provides an environment desirable to you. Thank you for visiting HomeSense by HomeMarke Real Estate Services of Jacksonville for information on using a cash gift as a down payment. We hope that you will find this article informative. If buying a home is on your list and you are thinking of applying your cash gift towards a downpayment, good for you! We hope that you will consider using HomeMarke i-Search and a HomeMarke Jacksonville area Realtor to help you find it! We explain the tax details around giving the gift of a home down payment. With lots of inventory and low home prices, your gift of a down payment to your credit-worthy children can be a stepping stone to getting into a first or next house. A nice thought at this time of year. (I’m speaking both of the holidays and the upcoming tax season.) Speaking of which, there are rules — like there’s no tax deduction for giving a non-charitable gift. But your gift of up to $13,000 can be given tax-free. My husband and I used our parents’ generous wedding gift as a down payment rather than spend it all on the wedding. And we’re not the only couple boosted into home ownership by parents, according to blogger Amy Hoak. She says about one-quarter of first-time home buyers get a down payment gift from relatives or friends (note to my friends: My birthday is coming up in February and nothing says you’re my BFF like a down payment!). The rules for using down payment gifts differ depending on which lender you use and whether your loan is guaranteed by Fannie Mae, Freddie Mac, or FHA. Hoak outlines the rules for each in her blog. If you’re the one making the down payment gift, you won’t have to pay federal income tax, nor will the recipient, as long as you give $13,000 or less in 2011 or 2012. You can give up to $13,000 per person without tax implication to any number of people in one year. In addition, you and your spouse can each give separate gifts to your child. The IRS calls this gift splitting. For instance, if you’re planning to give to your two children, you and your spouse can each give each child up to $13,000 for a total of $52,000 ($13,000 x 4), says CPA Sue Medicus, owner of Liberty Tax Service in Catonsville, Md. If you want to give more, you still may not owe taxes, but you have to inform the IRS of your gift using Form 709. Check with your tax adviser to see if the amount above $13,000 counts against a lifetime exclusion that we all get to use to pass along assets via gifts and estates, Medicus says. You can’t deduct the value of gifts you make (other than gifts that are deductible charitable contributions) or any federal gift resulting from making those gifts. For more, IRS Publication 950 outlines the rules about gift and estate taxes. What do you think about making down payment gifts to children? Have you done it? Would it have helped you? If you bought or sold a home in the middle of 2011, figuring out what to put on line 6 of your Schedule A Form is tricky. They’re not as much as they used to be, but there are still energy tax credits to be had for upgrades made in 2011. $500 is a lifetime limit. If you pocketed $500 or more in 2009 and 2010 combined, you’re not entitled to any more money for energy-efficient improvements in the above seven categories. But if you took $300 in the last two years, for example, you can get up to $200 in 2011. And not all products are created equal in the feds’ eyes. Improvements have to meet IRS energy-efficiency standards to qualify for the tax credit. In the case of boilers and furnaces, they have to meet the 95 AFUE standard. EnergyStar.gov has the details. Determine if the system you installed is eligible for the credits. Go to Energy Star’s website for detailed descriptions of what’s covered; then talk to your vendor. File IRS Form 5695 with the rest of your tax forms in 2012. You take a tax deduction for property taxes in the year you (or the holder of your escrow account) actually paid them. Some taxing authorities work a year behind — that is, you’re not billed for 2011 property taxes until 2012. But that’s irrelevant to the feds. Lenders require home buyers with a down payment of less than 20% to purchase private mortgage insurance (PMI). Avoid the common mistake of forgetting to deduct your PMI payments. However, note the deduction begins to phase out once your adjusted gross income reaches $100,000 and disappears entirely when your AGI surpasses $109,000. Also, unless Congress acts to extend the PMI deduction again, 2011 is the last tax year for which you can take this deduction. This deduction may not be as good as it seems. It’s complicated, often doesn’t amount to much of a deduction, has to be recaptured if you turn a profit when you sell your home, and can pique the IRS’s interest in your return. Hampton’s advice: Claim it only if it’s worth those drawbacks. 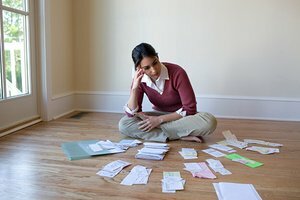 If so, here’s what to know about what you can write off. While the original home buyer tax credit deadline passed in April 2010 (and isn’t available in 2012), military families and some government workers on assignment outside the U.S. were given an extension until April 30, 2011, to get a home under contract and take advantage of up to $8,000 in tax credits for first-time buyers and $6,500 in credits for repeat buyers. If you sold your main home last year, don’t forget to pay capital gains taxes on any profit. However, you can exclude $250,000 (or $500,000 if you’re a married couple) of any profits from taxes. So if you bought a home for $100,000 and sold it for $400,000, your capital gains are $300,000. If you’re single, you owe taxes on $50,000 of gains. However, there are minimum time limits for holding property to take advantage of the exclusions, and other details. Consult IRS Publication 523. If you made any eligible improvement, fill out Form 5695. Part I, which covers the 30%/$1,500 credit for such items as insulation and windows, is fairly straightforward. But Part II, which covers the 30%/no-limit items such as geothermal heat pumps, can be incredibly complex and involves crosschecking with half a dozen other IRS forms. Read the instructions carefully. What will a HomeMarke agent do for you? https://homemarke.com/wp-content/uploads/2017/05/HomeMarke-Blue-Logo-copy-300x200.png 0 0 Shane Denmark https://homemarke.com/wp-content/uploads/2017/05/HomeMarke-Blue-Logo-copy-300x200.png Shane Denmark2012-02-15 14:43:392012-02-15 14:43:39What will a HomeMarke agent do for you? For most of us, buying a home is the biggest single investment we’re likely to make – and we’re only likely to do it maybe once or twice in a lifetime. The process is, by nature, filled with checks and balances – and many complex details. Meanwhile, the most common form of agency is HomeMarke’s Transaction Broker Agent. Unless you actually sign a Buyer/Agent agreement , this is the type of agency that should expect from a Real Estate agent unless they are working specifically as a Seller’s Agent.